For many, the Diablo games are the go-to when it comes to the action-RPG genre, and while there have been plenty of hack and slash, dungeon crawling, loot-based adventures over the years, only a handful have come close to the bar set by Diablo. Warhammer: Chaosbane might just be a Diablo-alike worth keeping an eye on, however. Set within the classic Warhammer fantasy realm, Chaosbane provides a hefty dose of dungeon trawling for up to four players, with a king's ransom in loot to scoop up, countless enemies to slay, and four distinct characters to choose from that fulfill the traditional ARPG archetypes. There's the high elf mage Elontir, human soldier and Captain of the Empire Konrad Vollen, a Dwarf Slayer (shown for the first time in our gameplay), and a wood elf Waywatcher to choose from, each with their own distinct abilties designed to work together during co-op sessions. 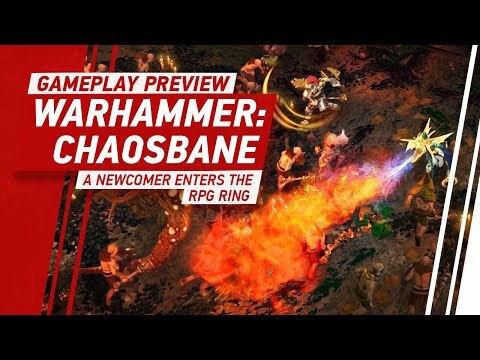 For a closer look at a bit of 2-player co-op Warhammer: Chaosbane gameplay and some interplay between the three characters revealed to date, check out our video below. You'll be able to delve into Warhammer: Chaosbane when it launches for Xbox One, PlayStation 4, and PC later in 2019.